Combine figs & water in a saucepan over medium heat. Bring to a boil & cook until tender, and liquid has reduced. Remove from heat & stir in the olive oil, balsamic vinegar, rosemary, thyme, & cayenne. Add olives & garlic, & mix well. Season with salt & pepper to taste. Cover & refrigerate for 4 hours or overnight to allow flavors to blend. Unwrap cream cheese block & place on a serving platter. 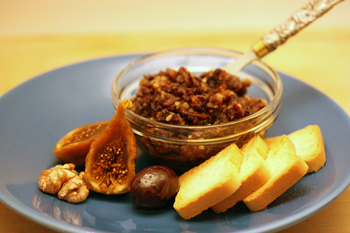 Spoon tapenade over cheese, & sprinkle with walnuts. Serve with slices of French bread or crackers.